Handcrafted in our own studio located in Oak Bluffs, Ma. 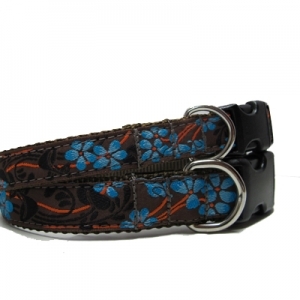 Blossom in brown and blue is available in 3/4in, 1in and 1.5in widths. Harness, martingale and martinglae combo is available. • Durable nylon or eco-friendly hemp webbing available.